I was cutting some apples to make apple rings. I accidentally cut my finger a little. I asked Audrey to finish and she helped me. I started to eat the apples. Momma was helping me with school work. She asked if I cut my finger and I said “a little bit”. She told me to look at my finger. It was bleeding badly. She told me to wash my hands and get a bandaid. 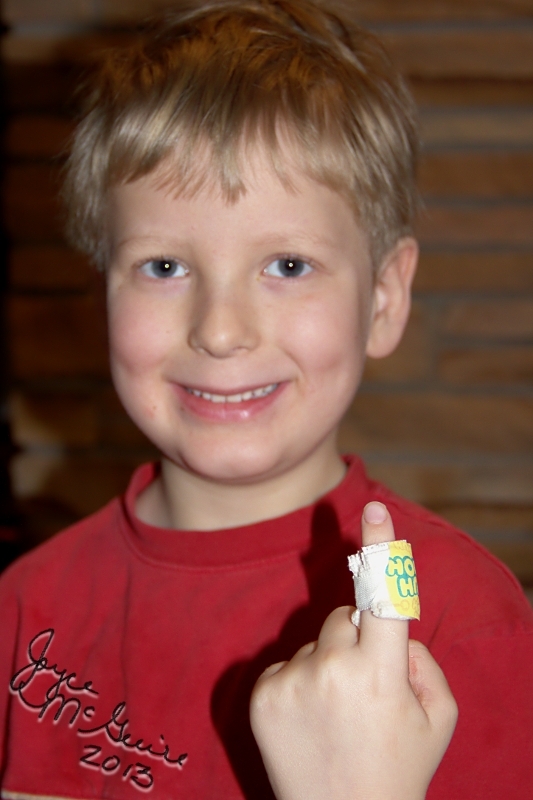 My first bandaid was Scooby Doo one. It bled through fast! Momma told me to wash it good again. It was bleeding so bad, Momma had to get a thick bandaid! My finger is okay. I think it is still bleeding a little when I bend my finger, but not much. Momma laughed. If Audrey cut herself, even a little bit, she would have wanted a bandaid. I knew I cut myself, but ignored it.